Since Pokémon GO launched on July 6, 2016, it has gone from a much-hyped mobile game to a national cultural sensation. It has roughly 26 million active users playing the game each day, and that’s in the US alone. It’s produced huge daily revenues from micro transactions, has unusually high retention rates, and has caused Nintendo’s market value to both skyrocket and plummet over the course of one month. Pokémon is a popular game series where players try to catch cartoonish monsters throughout the digital game world. Pokémon GO is a new take on that popular model where instead of an artificial map, players visit real world locations to catch the creatures. When players come across a Pokémon (randomly generated in the area around their GPS location), they use their phone’s camera to find the creature in augmented reality (AR) and throw virtual ‘Pokéballs’ at it. At this point you may be wondering, “Why should I care?” Indeed, museum curators and staff may know it as that silly game that people are playing instead of actually engaging with the exhibits. And some institutions, like the National Holocaust Museum in Washington, D.C., have asked Pokémon GO’s developer to remove in-game digital landmarks in their space due to the sensitivity of their mission or collections. Though I agree that it’s tasteless to play in certain settings, I argue that museum curators should try to see the potential of Pokemon GO and similar apps. Pokémon GO specifically has the potential to be a revenue and engagement booster for museums across the country. While some argue that people who are playing on their phone at a museum aren’t paying attention to the exhibits themselves, others have already embraced the game as a way to attract more visitors. The McNay Art Museum in San Antonio, Texas, for example, encourages younger players to play at the museum in the hopes that it will promote their policy of free admission for people under 19. The Philadelphia Museum of Art hosted a Pokémon GO meetup that boosted their attendance 13% over the previous week and 25% over the same time last year. Pokémon GO is especially popular with younger crowds, and if museums embracing the game gets more young people to tell their parents, “Let’s go to the art museum, there are 6 Pokéstops there,” that’s a win for the gallery. Now they have a younger attendee who’s ambivalent towards the actual exhibits, yes, but they also have 1-2 parents who will need something to do while little Johnny tries to catch the Pikachu in the modern art wing. These kinds of games are likely here to stay, so museums should embrace their attendance-boosting potential. Pokémon GO’s success shows us there’s a better way to enhance attendees’ museum experience. 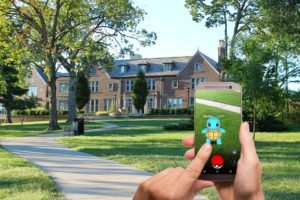 Hits like Pokémon GO will come and go, so beyond embracing individual games, there is huge potential for museums to adopt the Pokémon GO model, whether that’s expanding the capabilities and functions of apps they already use, or creating entirely new ones. Some larger museums already have the infrastructure in place to push their boundaries. Many of the world’s largest museums have apps with interactive maps, quizzes, and extra museum info. One art museum’s app, for example, has guided tours, a virtual walkthrough of the museum, and a large database of info about key objects, sorted individually or by exhibit. While that same app has tons of information about its artifacts, navigating to information about a particular artifact is awkward. The primary way to find an artifact (other than the clunky built-in search feature) is to scroll through hundreds of images to find the object you want to know about. For the casual museumgoer, it’s way more trouble than it’s worth to try to find info about a specific artifact. The missing piece is location-based augmented reality. Introduce Pokémon GO style AR to the art museum’s app and suddenly the whole app is much more intuitive. 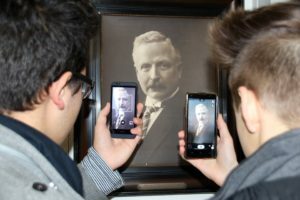 Users could simply point their camera at a work of art or into an exhibition hall, and information on it would be available to them with one tap. Quizzes could become engaging quiz/scavenger hunt hybrids where users must first find the works then answer questions about them. Mobile AR’s potential doesn’t stop there. Most museums keep huge portions of their vast collections in storage. Augmented reality could open the doors to the creation of an entirely different museum experience. With a little bit more investment in a museum’s app, a virtual tour could include an AR mode where users could see what other works have been in a hall, superimposed over the current exhibit. Such an update would be almost equivalent to renovating the entire museum, for a fraction of the cost. If you’re thinking that this kind of update is unrealistic technologically and financially for museums, look no further than the Smithsonian, whose free app has a built-in AR feature. Using the phone’s built in compass, GPS, and camera tracking, users can point their phones at almost anything in the Smithsonian and click on an icon that tracks above it. This technology is here. It’s accessible to museums. Whether curators are embracing popular games to boost their attendance or modernizing their own apps, AR is the next step that museums should take into the digital world. In a time when the average American is spending 4.7 hours per day on their smart phones, museums need to take steps to stop their content from being filtered out and start filtering it through phones.